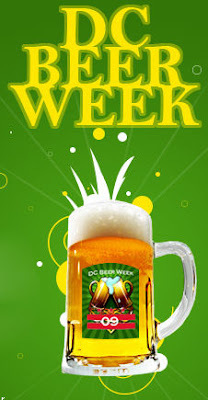 DC Beer Week (www.dcbeerweek.com) runs today (Sunday, 16 August) through Friday, 21 August. That's D.C., as in Washington, District of Columbia. 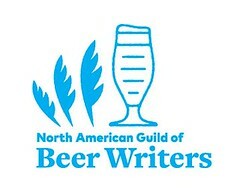 But it's the first time the capital city of the United States has ever had a week-long celebration of beer culture. I recently sat down to discuss the festival with its two principal organizers, 'Hoppy' Jeff Wells and Chef Teddy Folkman. Jeff (R) is a long-time beer maven of the area; Folkman (L) is chef at Granville Mooore's, a Belgian-inspired brasserie, located in the newly vibrant H street corridor of the Trinidad neighborhood in northeast Washington, D.C. He is associated with several other establishments. WARNING: I foolishly chose to drive from northern Virginia, during afternoon rush hour, over the 14th Street Bridge. The trip --just the segment over the bridge-- took nearly an hour. That's due to extensive construction and heavy traffic. Don't repeat my mistake. Take the DC Metro to Gallery Place, where the H Street Shuttle bus runs for free. I began by asking Jeff and Teddy about some sniping on the 'interwebs'. Some groused that DC Beer Week will only extend over 6 days. And others asked why the festival will occur during the traditional height of DC's hot and humid summer weather, and when many residents have gone on vacation. Both Wells and Folkman laughed. If the festival were to extend for an extra day, would folks complain that it was, as the Beatles sang, eight days a week? And, as Folkman pointed out, despite the heat of August, the week following DC Beer Week is DC Restaurant Week. The duo feels that when business is slow, that is exactly the proper time in which to build up more business and "buzz". As we were served glasses of draught Chouffe Houblon, we began to discuss the pairing of beers and food, one focus of the week's events. I mentioned a cultural bias, among some, of recognizing only wine with food. "I hate Merlot", Folkman blurted out in response, quickly noting that pairing should be "about matching flavor and intensity." Wells argued that "DC is the fastest-growing culinary town in the US." And Folkman agreed. "The city's vibe is grass-roots. Many in the DC food scene are 'lifers'. Soon sitting down with us was Chris Surrusco, General Manager of Marvin, a Belgian-themed pub and restaurant, in the bustling 14th & U neighborhood of northwest DC. Surrusco has also been actively involved in the planning. "There's been a lot of quiet representation of beer and food in D.C.," he said. "This week can be a showcase." Folkman emphasized the re-growth of distinct districts of night-life venues and restaurants ... but with a twist. "DC is fast becoming a beer and food city." In fact, he said, the festival plans to expand throughout the city. "In 2010, we'll have volunteer captains in as many neighborhoods as possible." This year's 'week' begins today (Sunday, 16 August) from 2-8 pm with a “Unity Jam” at the Rock & Roll Hotel — For $20 you can buy ten 4 oz. 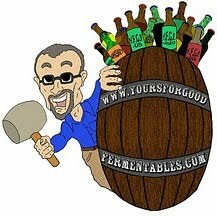 sample pours of rare craft beers. Bands include See-I, The Blackjacks, Laura Tsagaris Band, and The Jeff Wells Band. The week concludes with a baseball game: the Nationals vs. the Milwaukee Brewers, Friday evening at 7pm, at National Park. DC Beer Week attendees will receive discounted tickets in selected areas of the ballpark. Mezzanine seats for only $23 (regularly $30) and LF/RF Reserved for only $16 (regularly $24). To purchase, call Mike Benko of the Nationals at 202-640-7648 and mention “Beer Week”. "DC Beer Week 2009 ends with the Brewers. How cool is that," exulted Chef Folkman. "Let's make it a city-wide celebration." The rest of the schedule here. Prior YFGF posts here and here.